Q: Is this your first time choreographing for a story with a Chinese background? J: Yes, it is. 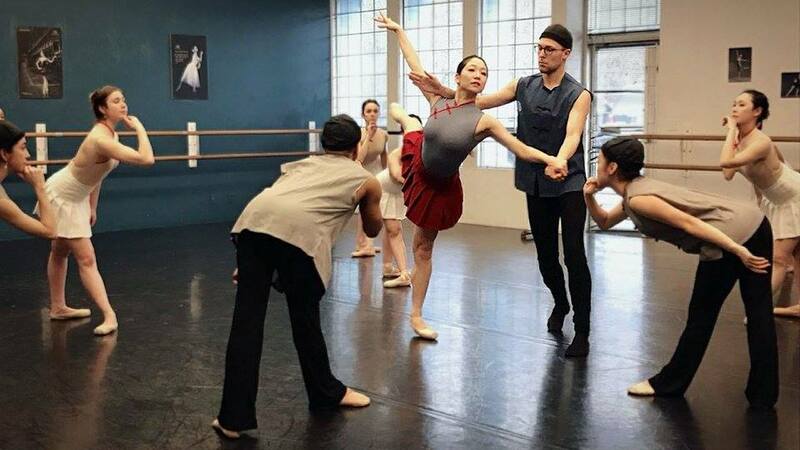 I actually trained here at Pacific DanceArts with Li Yaming [Founder of Coastal City Ballet], but I had never danced in anything of Chinese culture-wise here, and I have never been involved in ballet in terms of Chinese culture. And so when Li approached me to come back and make a work with Coastal City, he proposed creating a ballet to this traditional Chinese folktale and then also asked if I could produce it with the music that was composed for it. And I loved the music, it’s very beautiful and so I connected with it instantly. But it is my first time working with source material that is Chinese. Q: Have you changed any of the plot of the story? J: I haven’t changed the plot all, but I kept it a bit more abstract, so it’s not necessarily set in a particular time. And I added things like where there is a dream sequence where she imagines being able to tell him that she’s a woman. So there are little things I added because one thing that was a bit challenging is that this story has almost no female characters. And this is a ballet company, mostly predominated by women. So I have all these fantastic female ballet dancers who are great at dancing en pointe but have no characters for them. So I’ve tried to find creative ways of using the dancer’s ballet ability and femininity within the story. Because most of it takes place at a boy’s school, and there aren’t very many male dancers. So the female dancers are – also interestingly and parallel to the story – the female dancers are dressed as men, partnering with the women as men, some of the time. So I like that. It’s kind of continuing to challenge gender through how I present the work itself, which is relative to the story as well. Q: What kind of traditional Chinese cultural elements do you have to work in or eliminate from what you are perceiving? J: Actually, just now, some of the costume came in. I had to imagine that when she is getting ready for her wedding, we would see her in white. And then I went to look at the costume and there is no white costume, and Li is like “well no, actually you can’t. Because white in Chinese culture means death, so she wouldn’t wear that at her wedding.” So there are things like that, like lapses, in my understanding of Chinese culture, that I have relied on Mr. Li to help me understand so that I can be adding something into the story without being culturally incorrect or insensitive. It’s more imagery. When they become brothers for life, I was asking Mr. Li “What would that be like? What would they do with one another to prove that they have this friendship bond that is going to last this long?” And so I’ve been sourcing from him a lot because strangely there are no Chinese dancers in this piece, and I am not Chinese. So he is the Chinese connection. And then one of my board members from my company, Lisa Ho, is also Chinese, so I’ve also been asking her for advice as well. Q: So it’s a premier? J: It’s a premier, yes, a brand new work. Q: Who is the principal dancer? J: The principal dancer is Yoko. She is Japanese and actually I trained here with her. We were in the same class and then we both went on to do different things in our career. But then she has come back to dance with Coastal City. We haven’t seen each other since we were 17 years old, so it’s been quite incredible to collaborate with her. And Thys Armstrong, who has been with the company for a number of years, he plays the male lead. I also have a figure that represents her father and also a man that she’s betrothed to married with. So there are four characters and then everyone else represents various boys in school or the people helping her getting ready for her wedding – they’re more periphery figures. Q: How about the technical side, is this one hard to dance for dancers? J: Yes, you should ask the dancers about that. I’ve been trying to use their incredible virtuosity. And my movement language is very complicated. And so I think that might be more of a challenge for them is that there’s a lot of steps. I’m really trying to avoid mime, so I am not trying to say “I love you” [with hand gesture] instead, I am trying to directly infuse the movement language or the steps that I’m creating with everything that you need to know theatrically. So it’s a little bit less literal and more about how the dance will make you feel. I think that could be a challenging balance for dancers to find, especially younger dancers. But it’s also very fast. There are sections in the music that are very very fast, so some of the choreography is very technically challenging as well. Q: How would you compare – I know Coastal City Ballet has done many famous love stories before, like Romeo and Juliet and other stories. How would you compare this one to the western love stories? J: What I like about this love story, especially for ballet, is the idea that they come to love each other in another context. They come to love each other as friends or brothers, but there’s something more that he feels about him [laughs]. It’s when he discovers that she actually is a woman, how he felt all along makes sense to him. And I think that there’s something really beautiful about the fact that they came to love each other regardless of the context of their body or their form and then the way that they love each other changes as a result of that; that how they care about each other is beyond that. So I think it is far more complicated, complex and beautiful than a lot of the traditional western love stories. That’s what really drew me to it and I think that is an interesting story that still can have relevance to our time. Because now we might not have women having to dress as men to go to school, but there’s still something really interesting about that idea of what it really means to love someone regardless of how you directly see them. Q: So do you find that this involves more acting than some of your other pieces? J: This is definitely one of my first narrative works. I’m also working on a full length, new version of Giselle in New York right now, so I’m working on that in tandem with this, and that will premiere next year. And I’m working on an Edgar Allen Poe story as well, which is much more abstract. This is kind of sitting in the middle – so I’m abstractly referencing this Edgar Allen Poe story, this is sort of abstract-literal ballet, and then Giselle is very much a full story, two acts. This is definitely one of the more narrative, theatrical works that I’ve made , but this story is quite simple – it’s a good story – so you don’t need to know a lot to feel what she’s feeling. Most of the acting falls on Yoko. Q: What do you see that this piece does for a city like Vancouver – for the dance scene? J: What I like about being able to do this work and create this work in Vancouver is that we’re unique to have such a fusion of so many different cultures to it, especially from Asia. I’ve grown up immersed in that, so for me to be able to create something in conversation with these existing cultures that are so prevalent in the city that I am from, I think it’s very beautiful. I feel very honoured that I’ve been asked to share my perspective on a story and a culture that isn’t my own. I think that kind of openness to exchange and to new ideas, that it’s not an appropriation it’s an invitation, to take your story and think about what it means to me – I think that is important. Also there aren’t a lot of professional classical ballet productions being made in Vancouver en pointe. So as things move progressively more contemporary in the dance community here, I think it’s nice to see ballet dancers still dancing en pointe, in a language that is of our time, but that we aren’t showing work that is in socks or bare feet. A: 我曾經在溫哥華的太平洋舞蹈藝術學院跟李亞明老師(海岸城市芭蕾舞團創辦人)學舞, 但是我從未表演過或參與過任何跟華人文化相關的作品. 李老師要請我回來用一個以中國傳說為主同時用了為這傳說所編的音樂編舞. 我很喜歡這音樂(梁祝), 它很美我也立刻對它產生了感覺. 這是我第一個有華人文化特色的作品. A: 我完全沒有改, 但是我有點把它抽象化了, 所以可能時間的排序可能不一樣. 我有加入一些情節如有一段在夢裡祝英台想要告訴梁山伯她的女兒身. 這些改變是因為這個故事本身沒有太多女性的角色, 但是我們是個芭蕾舞團大部分的成員都是女性. 我要設計橋段可以讓我美麗的女芭蕾舞者有機會可以用芭蕾足尖舞鞋來表現女性優美的特性. 因為故事發生在一個男校, 而我們也沒有很多男性舞者, 所以女性舞者則需要跟故事內容一樣女扮男裝的演出. 我很喜歡這樣的連結. 這好像我挑戰我如何呈現這類型與性別有關的作品. A: 我們才剛剛收到一些劇服, 我原先想像祝英台的婚禮可能會穿白色禮服; 當我找不到白色的劇服時, 李老師告訴 我白色在華人文化裡面代表死亡. 類似這樣的文化差異是我需要仰賴李老師來幫我, 確定我沒有觸犯文化中的禁忌. 我們這次沒有華人舞者, 我不是華人, 所以需要一直仰賴李老師, 及我自己舞團的一位華人理事來找我的答案. A: 或許應該問舞者. 我一直要 求他們要用他們最極致的美感. 我用的動作語言是很複雜的, 所以可能是很有挑戰性因為有很多的舞步. 我也一直避免用模擬的動作, 用手語的方式去表達”我愛你”的意思. 我希望直接把感情加入的動作裡, 用劇場的方式傳達你需要知道的訊息. 所以不會太直接, 而是希望讓舞蹈來告訴你那種感覺, 這可能對一些舞者要找到那種平衡是有挑戰性的, 尤其是年輕的舞者. 但是整齣舞節奏是很快的. 有些音樂的段落是很快的, 所以我的舞在技術方面的挑戰性也很高的. A: 為什麼我喜歡這個愛情故事, 尤其是以芭蕾舞方式演出, 是他們的愛情是發生在另一種情境下. 他們的愛是發生在朋友與兄弟之間的; 但是梁山伯卻發現他對祝英台有另一種感覺, 直到他發現她的女兒身之後, 才一切都恍然大悟. 他們之間的愛情不是建立在他們的身體或形體, 他們對彼此的關愛卻是另一種境界. 我覺得這比更多西方的愛情故事更複雜, 難懂, 優美的. 這也是我為什麼讓我有興趣參與, 因為我覺得這個故事在今天仍然有它的意義. 或許我們今天不需要女扮男裝去上學, 但是我們仍可以去探索我們如何主觀的去看任何愛情故事. A: 我喜歡在溫哥華做這個作品是我們生活在一個很多文化融合的城市裡, 尤其是來自亞洲的文化. 我在這種環境裡成長, 能夠讓我在這個多元文化中與這些文化對話是很美的一件事情. 我很榮幸被邀請來分享我對這個原不屬於我自己文化的想像. 那種坦然地交換新的想法不是文化抄襲, 它是一種邀請, 讓我可以表達這個故事對我的意義是什麼, 我覺得這是重要的. 另外我覺得, 目前溫哥華沒有很多用芭蕾足尖鞋的古典或現代芭蕾舞作品, 所以當舞蹈社區一直大力地往現代舞發展時, 真的可以看到芭蕾舞者可以用芭蕾足尖鞋來詮釋我們這個世代的作品真的很好, 不用都只有襪子或是赤腳的演出.